Hello, I'm back with another card for the WPlus9 August release. I hope you've been enjoying the projects so far! Today I'm featuring the Wish You Were Here stamp set and die, the Starry Background die and the Gift Card Layers die. This was such a fun card to make! I started by die cutting the Starry Background and sponging it with Peacock Feathers and Dusty Concord Distress inks. Next I flicked water over the background and used a paper towel to soak up the excess water leaving watermarks on the background. I cut a piece of Glimmer paper that is just a tad bit smaller then the Starry Background and adhered it behind the technique piece so that all of the stars are shimmery (I wish you could see that in my picture!). The rest of my card is pretty straight forward, just some more die cutting and stamping. Thanks so much for stopping by, I'll be back on Friday with another card using the WPlus9 August release. Visit the WPlus9 Design Blog each day this week for more inspiration and for a chance to win some new product! Stop by and visit Kara, Joni and Kelly too!! Maureen arent they so cute. What a wonderful card. Gorgeous card, the bunnies are definitely adorable and made even cuter with the bottom stamping, lol. Those hugging bunnies are adorable. What a sweet card. I love the background you created to cut the starry night out of and then the white bunnies make it just so elegant. Oh my goodness Maureen, they ARE cute bunnies! Love the starry sky, beautiful job! What a dear little card. I love the background stamp you used. The sky is colored so beautifully. Pretty colored background for your sweet card! Love that Starry Background die... gotta have it! Beautiful background! I love the cute lil bunnies! Oh, this is absolutely darling. Love how you had the them facing the stars. Thanks for sharing. Darling card...what an effective way to say "wish you were here!" Awww, so sweet! 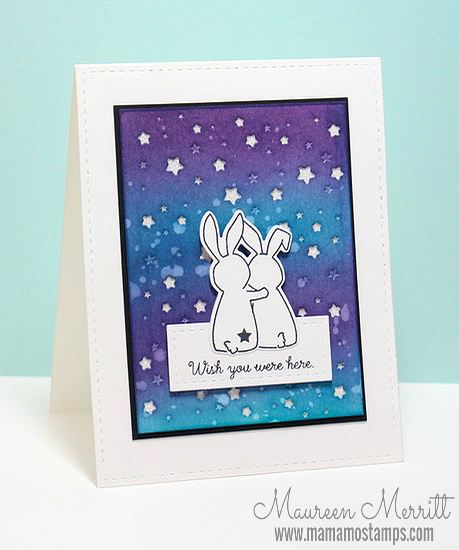 Love the starry background you created for your cute bunnies! So many adorable cards on this hop! Such a sweet card!!! Background is gorgeous!!! Love your background, and the adorable little bunnies. Thank you for sharing.